There are many lessons to be gleaned from failure, as illustrated in the following story of Marvin the Robot. I led a robotics design team during the final semester of my sophomore year. Our challenge was to design and create a small robot for our college’s annual competition. The winner would advance to the state competition, and the top three teams would then compete in the the American Society for Engineering Education (ASEE) competition, which, as additional incentive, was to be held in Hawaii. The robot had to autonomously traverse a 10 foot long track and dispense ping poing balls into baskets at each end of the track. The robot that successfully deposited six baskets in the shortest time would win the competition. There were financial constraints – the robot could not cost more than $300 to build. Our team was divided between mechanical and electrical engineering majors. Together, we developed a creative solution through an iterative process of trial and error. The primary challenge we overcame was to signal the robot that it had reached the end of the track by the use of a sonar sensor. Once it was within range, the sensor triggered the robot to slow down and dispense the ball. For other design challenges, simple solutions proved to be the most effective. We used empty spice containers as the holding dispenser for the ping pong balls. The cost of a couple of dollars for the containers was an added advantage. Mistake #1: Lack of a back-up plan. Instead of building a second iteration while keeping the original robot intact, we instead dismantled Marvin. We were overconfident in our ability to rebuild. This was motivated in part by a desire to improve the robot’s functionality, but also a less noble motive. Tired of the constant ribbing we received about Marvin’s crude appearance, we set out to make a sexier robot. This led to our second mistake. Mistake #2: Valuing form over function. There was no scoring provision for appearance. The robots were evaluated strictly on performance, and instead of designing for looks, we should have focused on what counted most – speed and accuracy. Mistake #3: Overconfidence resulting in a lack of preparation. It was difficult to maintain focus on the robot with each team member’s various summer plans. Although our intent was to have Marvin race-ready before tucking it away in checked luggage, we ran out of time. We reassured ourselves that we could finish Marvin in the hours prior to the competition. But hope is not a strategy. It would have been prudent to have allocated those hours to verifying Marvin’s functionality and counteracting any last-minute challenges. It is probably apparent where this story is going. Despite our heroic last-minute attempts, Marvin struggled in the competition and performed poorly. What was particularly frustrating was the realization that if we had made no changes and simply repeated our previous performance, we would have won the competition. The value of a simple design. 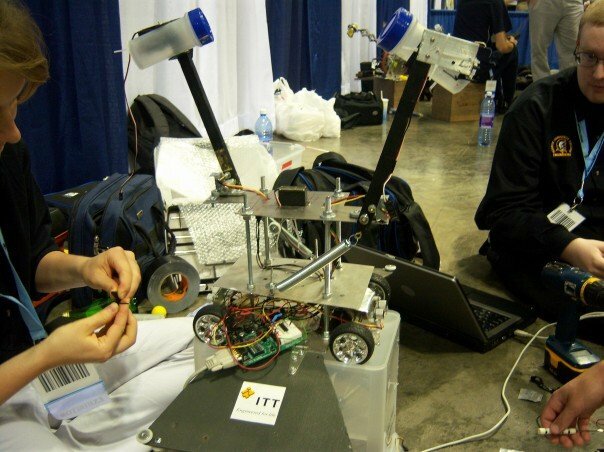 Many of the other robotics teams set out to create an ‘engineering wonder’, focusing primarily on creative innovation instead of consistent, reliable performance. We, too, eventually fell prey to this motivation. While innovation is a key component of excellence in design, the desire to ‘dazzle’ should have been subordinated to meeting the basic design requirements. We should not have allowed peer pressure from the other teams to motivate us to take on a risky redesign. The value of preparation. For obvious reasons, I had strong doubts that we would be successful in restoring Marvin to operating condition in the few hours before the competition. We should have reserved that time for final adjustments. But I ignored these concerns and instead allowed myself to be falsely assured we could prepare in time. Instead, I should have “pulled the andon” and rallied the team to prepare more adequately, especially considering I was the leader. The value of networking. The only reason we were able to even compete in the final competition was because of help we received from some of the members of the opposing teams. We had bonded with these members prior to the competition, and had offered our help to them at various points in the design process.These investments paid off when, an hour before the competition, we discovered that we had inadvertently short-circuited our robot’s main controller. Without a back-up controller (another key mistake), our only option was to build an analog motor control. However, we did not have a schematic available to guide us in building one. Two electrical engineers came over to help. They devoted the last hour before the competition to helping us, their competitors, build the needed circuitry. One of the engineers quickly scribbled a design for us to follow, and with 30 minutes to spare, we successfully built the required motor control. The benefit of having people you can count on when you are in a tough place cannot be underestimated. This lesson has proved invaluable to me in the working world. The value of determination and persistence. Even though we ultimately failed to place in the competition, we learned something lesson about character. Under intense pressure, we did not give in to the overwhelming temptation to give up. There was a sense of pride in how our team united in our determination to make a showing in the competition. We may have failed to win, but we succeeded in demonstrating persistence and team work. Marvin may now be in pieces, but the lessons the that our failure taught me remain. Due to the record high attendance, positive feedback, and unanswered questions from my recent webinar with KaiNexus, “How to Use A3 Thinking in Everyday Life“, we will be doing a follow-up webinar on March 6 entitled “A Deep Dive into A3 Thinking” You can register here – even if you cannot attend the live webinar, registration will allow you to get a link to the recording and the training materials. I’m very excited about this webinar, and I hope it will be value-added for those interested in further exploring the power of A3 thinking. That pesky Imposter Syndrome was again raising its ugly head. Most of us have experienced it from time to time – thoughts that we aren’t smart enough, experienced enough, good enough. Intellectually, I know these are lies – although I have much to learn, I do have valuable experience to share with others that has proven to be helpful to them. Nevertheless, I struggled with the thought of “who the heck am I to be doing something like this?” I reminded myself of a quote from Marianne Williamson that has become an recent anthem for me – “Your playing small does not serve the world.” And so I resolved to forge ahead. Concern about what others would think of me. Perhaps they might perceive me as being full of myself to be acting like an such an expert? Or perhaps they would assume my motivations were selfish? However, I knew what fueled my desire to share my knowledge. It truly was to break down a complicated but effective process into simpler steps to make it accessible to more people. I was not being paid to do the webinar, nor was I seeking clients. I sincerely wanted to spread the message of continuous improvement. The usual performance anxiety. I have given dozens of high-stakes presentations throughout my career, and in my personal life I have even successfully testified in an difficult court hearing. However, the fear of failure was nearly paralyzing. As I have in the past, I reminded myself that feeling fearful does not mean that I have to be afraid. The only way that fear can be conquered is by facing it. Despite these challenges, I did deliver the webinar and the feedback has been very positive. Most people commented that the presentation had good flow, was well-presented, and very engaging. A few people indicated they thought the example I used was too abstract, but given the nature of using a personal issue as a basis for an A3, it seemed unavoidable. I have worked on reducing my usage of filler words like ‘um’ and ‘so…’ but I still did sometimes. I need to reduce that further. My voice needs improvement around projection and inflection. Regarding the former, this has always been a challenge for me as I am naturally soft-spoken. However, some training exercises to strengthen my voice would help. The latter is a more recent discover after listening to myself. It’s particularly difficult to inflect during a webinar with no audience to see and interact with, but I think I can train myself to inflect more. Integrating more humor would have been my preference. The subject matter made it challenging to do so, but if I manage to get classes laughing at my silly jokes while teaching Control Charts and Measurement System Analysis, surely I could have injected more humor into A3 thinking. It was brought to my attention that I prefaced my answers to the questions at the end with “That’s a good question…”. I think I did that more because I felt comfortable answering it, rather than because they were ALL good questions! In the future, I will be more selective with using that statement. Finally, a little more banter with the host in the beginning would have helped me to relax and set a lighter tone, instead of the formal approach I took. I could have joked that I was an introvert that was good at faking extroversion or something like that. It would have been would have helped connect with the audience. I plan to do more webinars in the future (as a side note, please comment if there is a particular topic you’d be interested in), and I will definitely incorporate these lessons as I seek to constantly improve myself. I had the pleasure of presenting a webinar on A3 thinking for KaiNexus, a continuous improvement software company. I had a great time, and especially enjoyed engaging with the audience during the Q&A session at the end. We had over 700 registrants – lots of interest around this topic. I hope you find it to be value-added as well. I’m pleased to announce that on February 8, 2018, I will be presenting a webinar with Kainexus, a company that has developed a software solution to help engage the workforce in ongoing continuous improvement efforts. I have been a long-time listener to the Kainexus podcast, and it’s truly an honor to be presenting this webinar. To demonstrate how to use the power of A3 thinking in a real-life problem. You can read more and listen to the promo for the webinar here. Registration is still open – sign up here. At the 2018 AME Conference in Boston, I finally met Ron Pereira of Gemba Academy at Tuesday evening’s cocktail hour. I had done an interview with Ron almost a year prior, and was excited to meet him in person. We chatted for a bit, then he asked me if I wanted to do a video interview the following morning. I hesitated – there would be almost no time to prepare. But, what an opportunity! So I said yes. And I’m glad I did – I think it turned out well, and I know I enjoyed having a chance to talk about the lessons I learned from and after leaving Toyota. In both my personal and professional life (and the ever blending hybrid of the two), I have found that exploring different personality models is both highly interesting and has effective practical application. Earlier in my life, they were primarily helpful in understanding my own unique and often challenging personality. However, as I have matured, I primarily focus on how my personality type can best understand and interact with others, as well as how to amplify my strengths to mitigate my weaknesses (I could write a whole blog post about this, as my weaknesses are plentiful!) In this post, I cover a very basic overview of 4 personality models as well as discuss what my results are. I have listed some questions for the reader at the end that I would love your insight on, either by commenting directly on this blog post or on my LinkedIn post. I-Introversion. How one replenishes one’s energy. The traditional view of introverts is that they do not like to participate in social interaction. That’s not accurate at all. I very much enjoy social interaction in limited amounts, and particularly when I am with people who I know well and respect. Being introverted simply means that I need time by myself to recharge. For example, I am often outgoing and social at work during the week, but during evenings and weekends, I spend most of my time quietly at home, recharging for the next encounter. Shyness is also different from introversion and is more likely due to social anxiety. I used to suffer from this earlier in my life -I could hardly make a phone call- but with practice and patience it is usually no longer a challenge for me. J-Judging. What we do with the information we have processed – do we make a decision followed by execution, or do we continue endlessly exploring, processing, exploring – with no determinate end to the cycle? That is generally how Perceivers work. Now, I get along well with most Perceiving types, especially if they are INTP’s, INFP’s, ENTP’s, or ENFP’s (I struggle with the S types, but that is another post for another time). Some of the world’s most best scientists and thinkers were Perceivers – famous for their relentless pursuit and exploration of knowledge. Now, being Judging is very different from being judgmental. I am generally very open-minded and unlikely to judge people with absolutes – I truly am in no place as a person to do so. But my judging is both a strength and a weakness. It has helped tremendously in my personal and professional successes so far, but I have to be very careful to avoid judging without making sure I gain all the necessary input from others. Otherwise, I will very often make a judgement on incomplete and/or inaccurate information – dangerous, indeed, and I have paid for it. I’m actively working on this, which is also another post for another time! DiSC – Dominance, Influence, Stability, and Conscientiousness. I used to test as a CD, but a recent assessment showed me to be so strong of a C that I was an outlier among our group of 50 people. I believe this is because I have made peace with my nature. I am reserved, analytical, generally cautious, and reliable, and place the highest value on Accuracy (or, as I describe it, a relentless pursuit of truth). However, when the situation calls for it, I can be outgoing, driving, and have even been described as inspiring at times. Which brings up an important point – we can take on primary attributes of the other roles when needed. The categories are fluid and dynamic. Belbin’s team roles. When I was more focused on individual contribution earlier in my career, I identified as a Completer / Finisher. Others could and did rely on me to complete my work well. However, I now belong to the Executive / Analyst group. I believe this is due to my transition to the role of a team facilitator / leader. This was motivated by sheer need – it was neither efficient nor effective for me to try to accomplish everything myself. So while the Analyst is consistent with the results from above, at work I will often function as an Executive when others would benefit from my doing so. My husband might say I do that at home sometimes as well – perhaps more than needed! Recently a friend introduced me to the “Four Elements (Earth, Wind, Fire, and Air) approach. Although it is somewhat less specific and structured than other established methods, its broadness affords it some adaptability. Additionally, it is rich in history and practice. The test I took today indicated that my best match is Earth/Fire, or ‘Lava’ (granted, this is an unverified internet test, so take it for what it’s worth. The results did make sense to me). Most people are a combination of 2 or more types, which when you only have four, this is probably out of necessity! Per the description – highlighted emphasis is mine. In summary, I find the personality tests to be useful but neither absolute or incomplete. I recently made the mistake of assuming my ENFP (the type I naturally gravitate toward – so much different from me, yet our shared N gives us a basis for connection) friend and coworker wasn’t detail-oriented. I was completely wrong. The lesson learned was this: Do NOT, I repeat, do NOT apply a generalization to every individual. That’s a judgement I have regretted and resolved to be much more careful to avoid in the future. Use the personality types carefully, and always rely on observations and data to verify and deepen your understanding of yourself and others. Is there validity to these tests, when used appropriately? What are your test results? Do you find one test to be more accurate than others? Are there other approaches you would recommend that others explore?